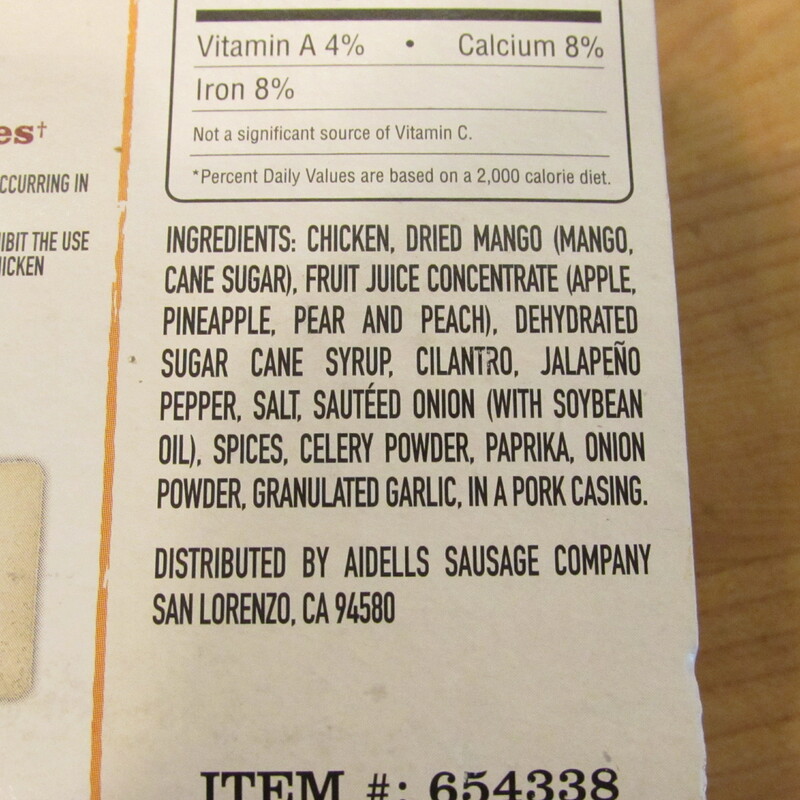 I love it when my local Costco samples various Aidells sausages. 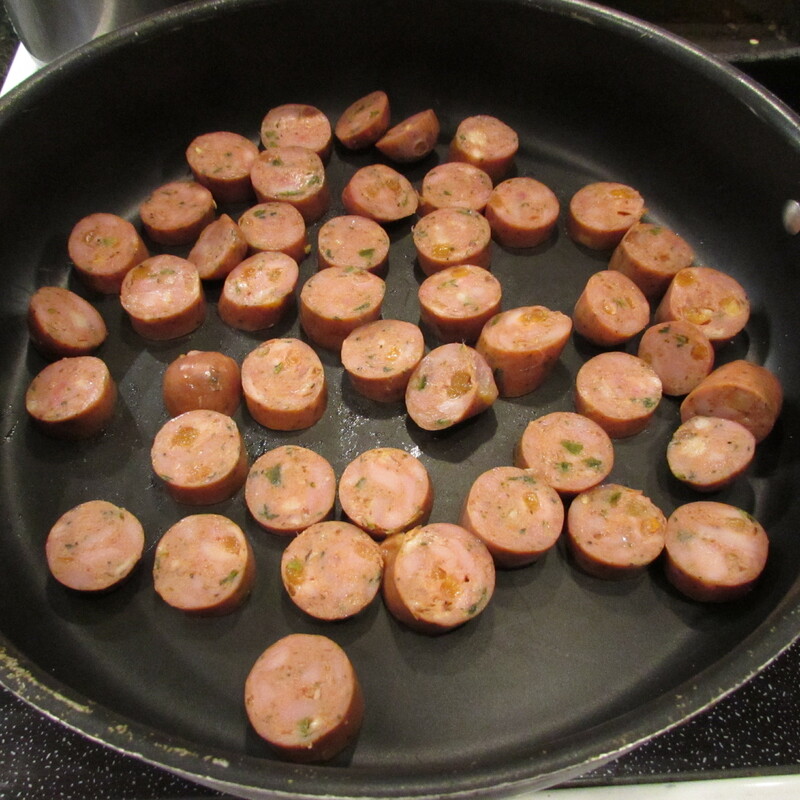 Although I generally pass them up for what I’ve come there for, sausages can be a really quick go-to appetizer or meal. 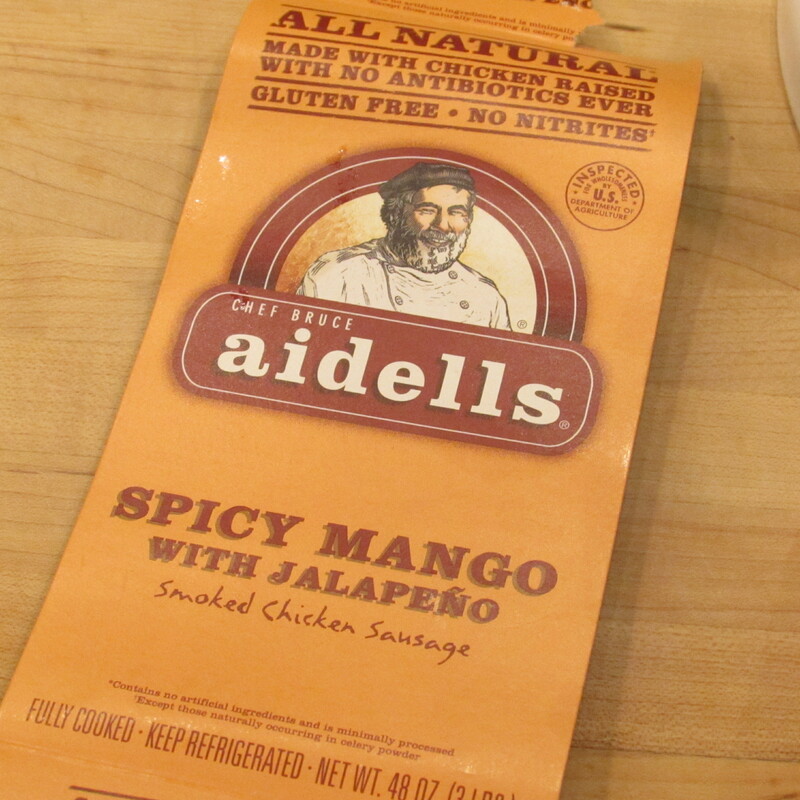 What’s even more impressive is that, if you take a quick scan over Aidells labeling, you’ll see that you can pronounce all of the ingredients. Really – check it out! Many times I just cut them into medallions, brown in a pan and serve them with nothing more than toothpicks but tonight they hit the main stage by way of primavera. This dish is so fresh and bright and carries so much flavor that no seasoning is needed. In fact, a little sprinkle of parmesan cheese is all the additional salt this dish requires. 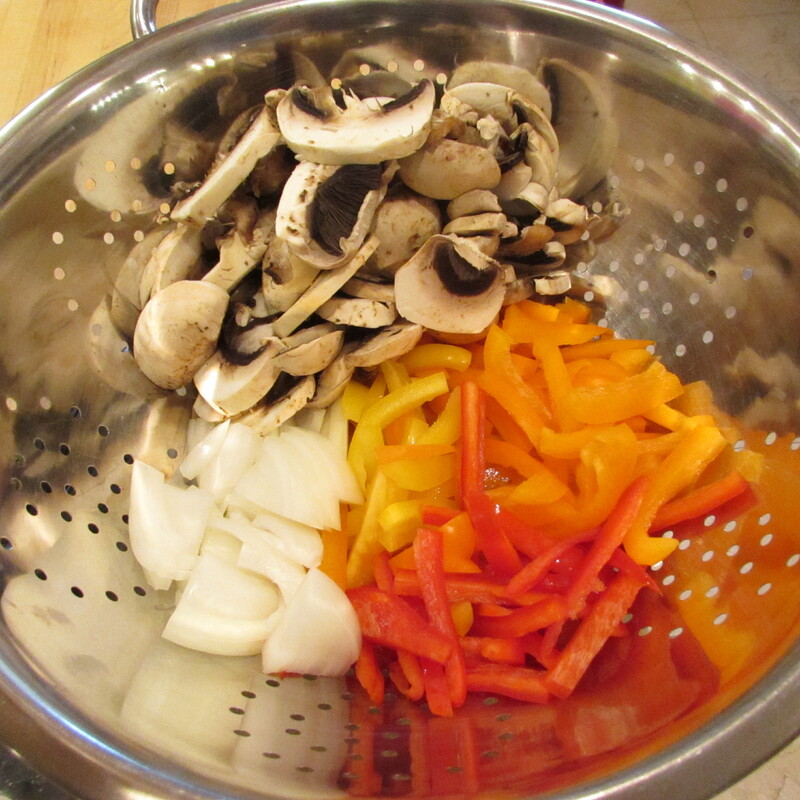 Fill pasta or other large pot ¾ way with water (filtered if your water quality is poor). Place pot on high heat and bring to a full rolling boil. 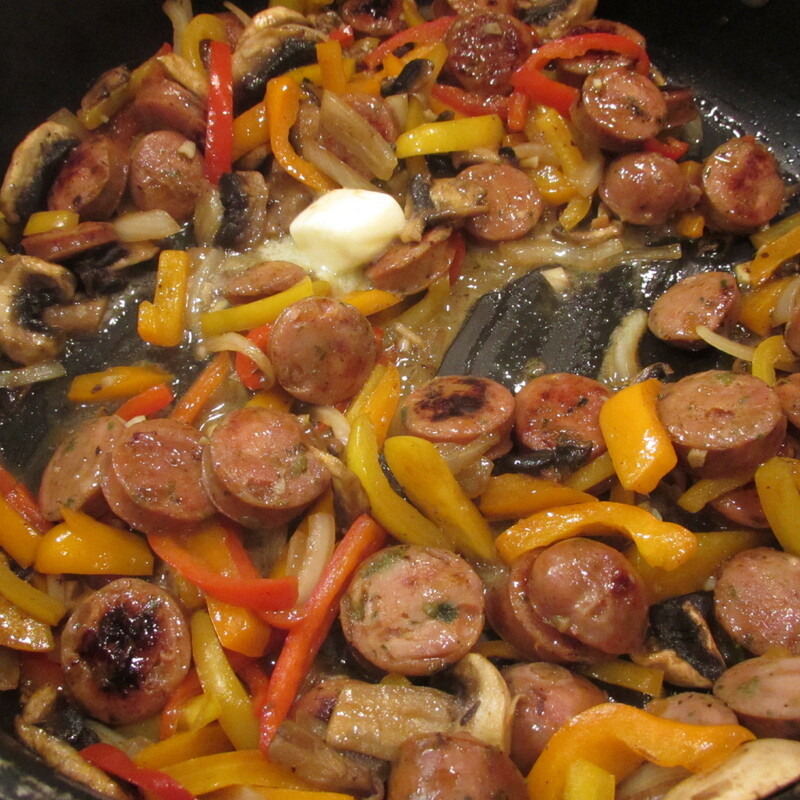 Once water is boiling, place sausage in a large skillet over medium high heat. 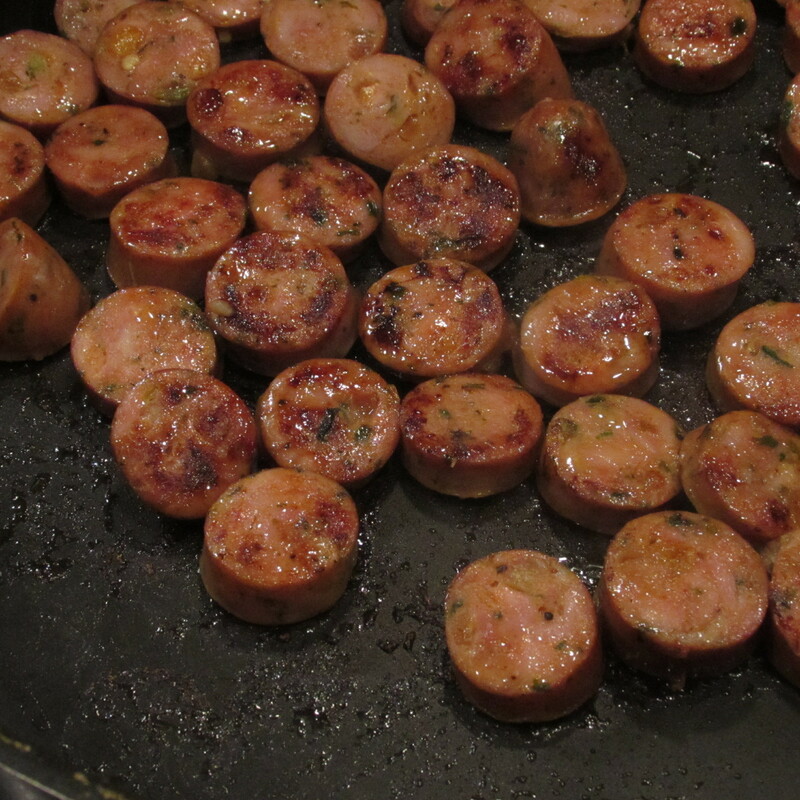 Cook sausage for a few minutes or until the underside is browned. 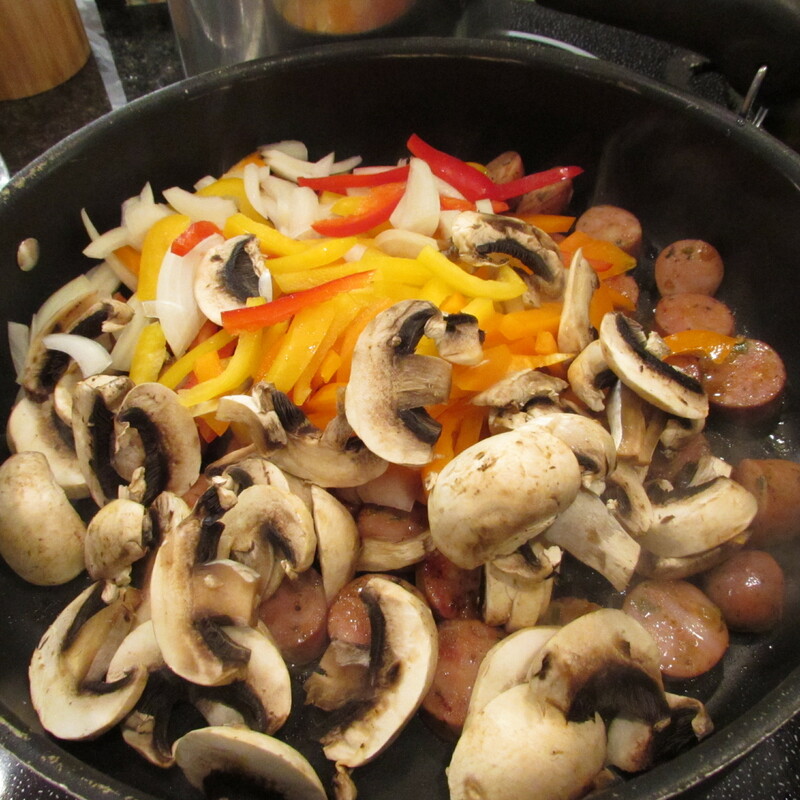 Turn and top with bell peppers, mushrooms and onion. Cook for a few minutes, stir, reduce heat to medium low and stir occasionally. Vegetables should be tender-crisp. While vegetables are cooking, place pasta in pot and boil for time indicated on package. 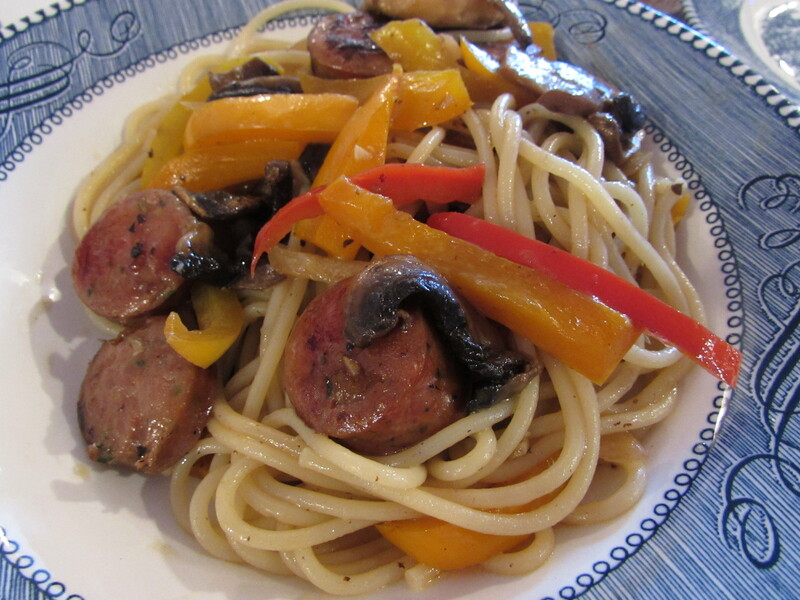 When pasta has only a couple of minutes left, melt butter and garlic with the sausage and vegetables. Stir butter and garlic in sausage/vegetable mixture. 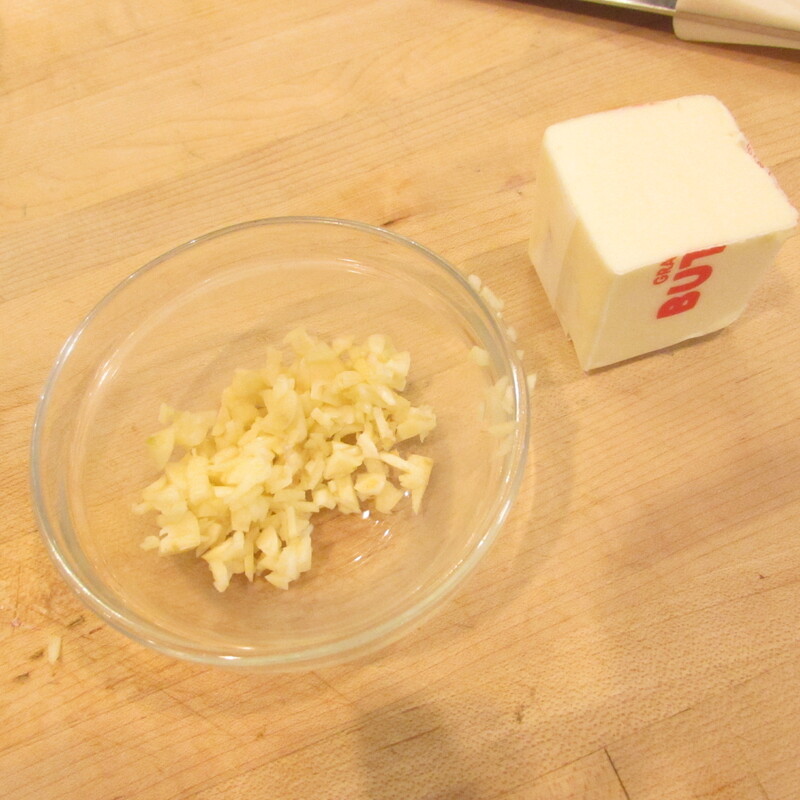 Once butter is melted and mixture is coated in butter/garlic, turn heat off. 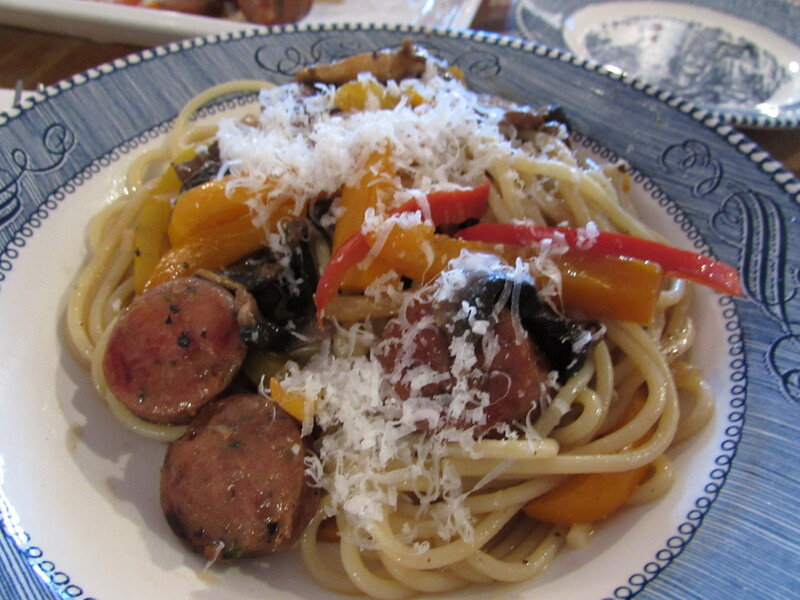 Drain pasta, top with sausage and vegetable mixture and garnish with a little freshly grated parmesan cheese. 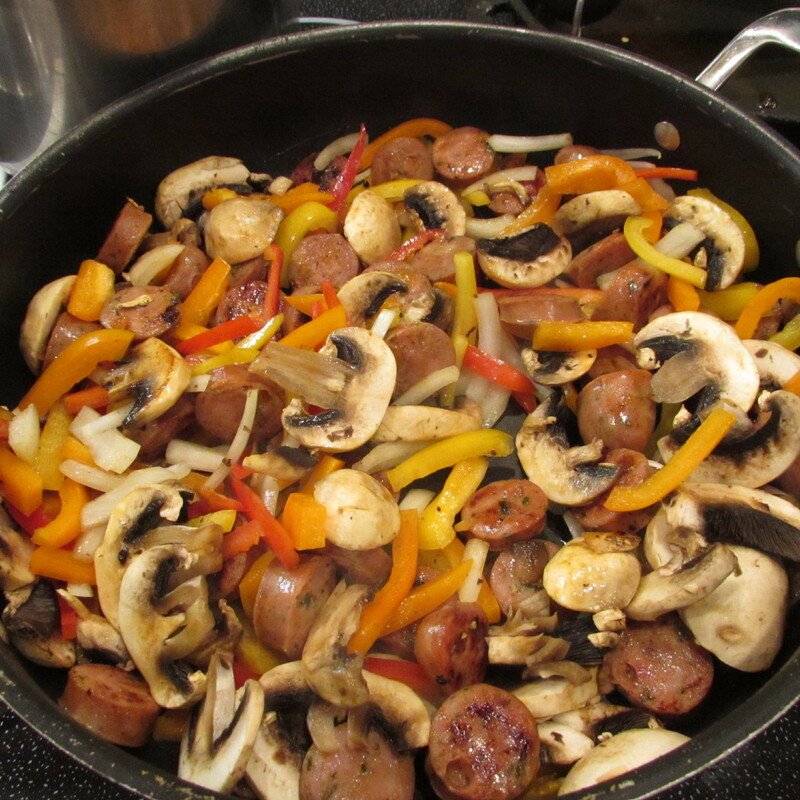 Tags: 30 minute dinner, aidells mango jalapeno sausage, bell pepper, dish, food, how to cook costco sausages, mushroom dish, primavera, sausage primavera, spicy pasta dish, with images. Bookmark the permalink.